Looking ahead in my Block a Day Calendar to see what's coming up for June, I discovered my tried-and-true Butterfly Block in a simple quilt. You mean you didn't remember what you designed for 2015, Debby? That's right! I create these calendars 1-1/2 years ahead (I'm 2/3 of the way finished for the 2017 calendar). And 2015 is the 10th year I've produced these things! So, you will have to forgive me. 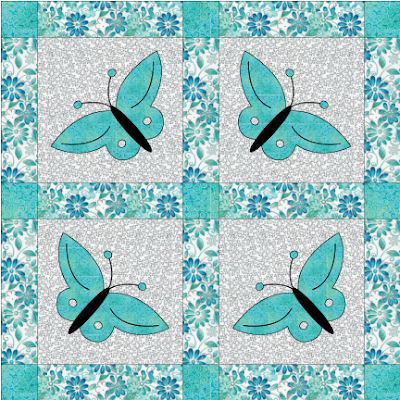 Butterfly Blues Block - 12"
I originally designed some projects for Blank Fabrics using their Inspiration Collection and my butterflies. This is actually a traditional block from about a hundred years ago! 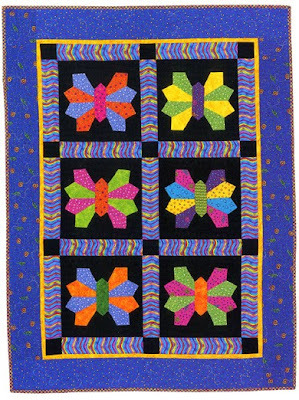 Butterfly Blues Quilt - 33" x 33"
Now, you may be thinking: why didn't she wait until Monday to share this? Think about it. Think about it. What happens on the first of every month? 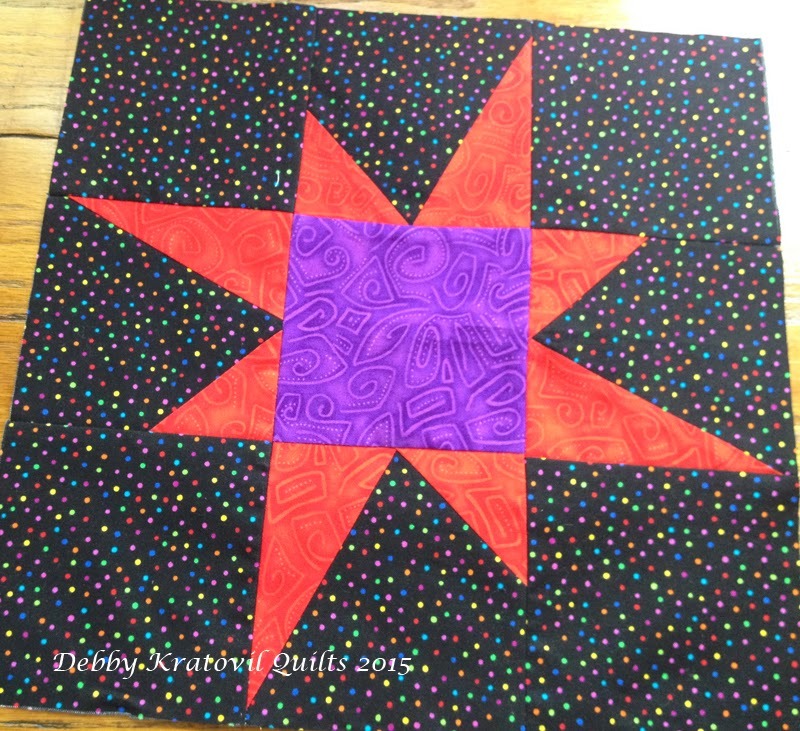 GALAXY OF STARS Block of the Month! Come back Monday for the June block. It's awesome. It's BIG. And it's easy to rotary cut. That's all I'm saying! A Civil War Sampler with 26 blocks! 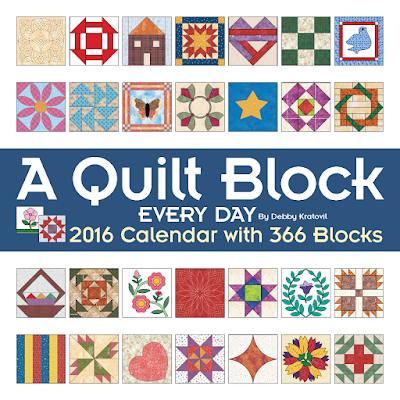 And soon to be released is my 2016 Wall Calendar of quilt blocks - just images, one for each calendar day. 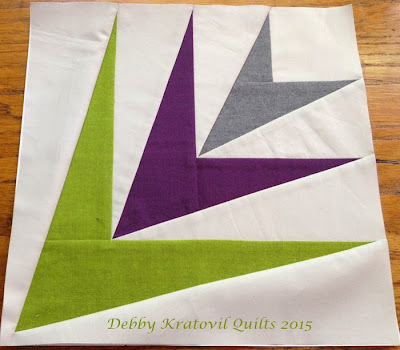 When my publisher asked me to do this, I said that I would like the rights to offer one or two of the patterns a week on my blog. They said, "Go for it!" 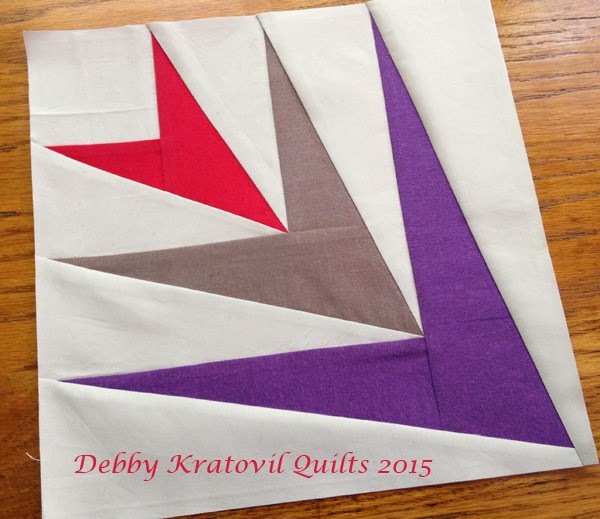 Be on the lookout for those free patterns to be issued concurrent with the calendar. Ask your quilt shop to carry it. I'm pretty sure the big box stores will have it in the calendar section. These blocks are taken just from my first 2 years of blocks! Is my head empty yet? Sometimes I think it's wise to listen to the voices in my head. They advise me about my quilts and usually are not wrong. Well meaning friends gave me their input on this new quilt that I've been working on for a few years. I would start; stop; pick it back up, and so on. I first made this one block quilt . . . I was just test driving making those pointy curved arcs. They remind me of a Pickledish unit. I liked them. Ran out of fabric so I began again with a new group. But I found I was running out of the green fabric and had to substitute some similar print (but same hue). Can you find the substitute? Those voices in my head were right. Just make what you love and be happy with it! First, let me say CONGRATULATIONS to Annie R. of Michigan, who won the fat quarter bundle of Burlap Brights from the Blog Hop last week. I hope you've been able to visit each of the bloggers and enter to win for each post. All ready for me to stitch down. No handwork! 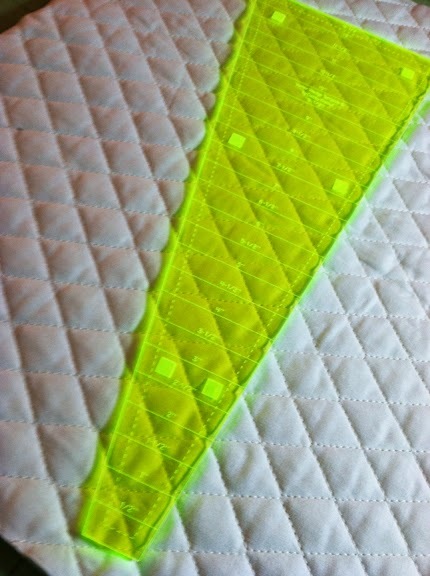 Not sure what angle this dresden plate wedge is, but it has worked for my other quilts. I'll keep you posted on this little 1930s gem. 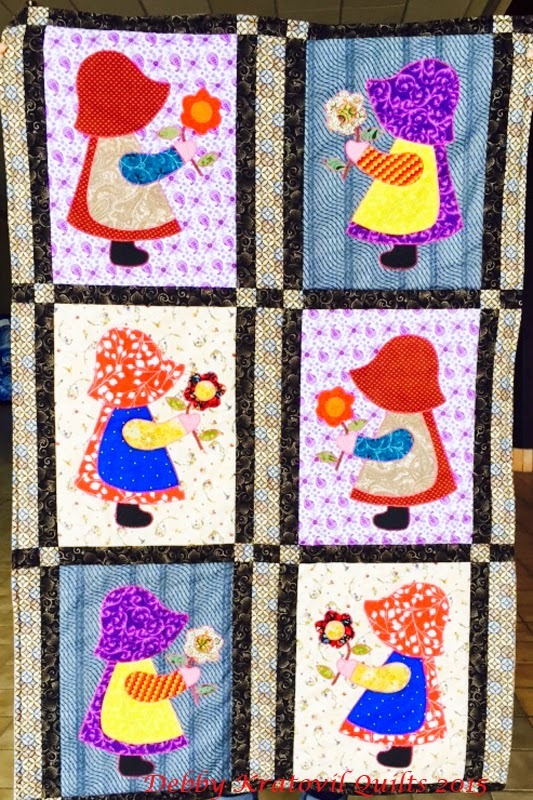 I received a lovely email from Vicki, who purchased a copy of my Sunbonnet Sue pattern from my Craftsy site. 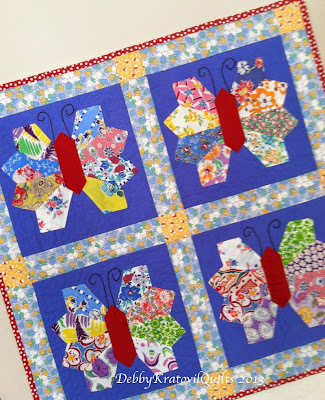 She showed me a six block quilt she made for a friend's baby using the Sunbonnet Sue applique. She did this in less than 2 month's time. When I saw it I immediately had itchy fingers, wanting to make a few blocks myself. What? Wasn't it enough to make that big bed quilt? 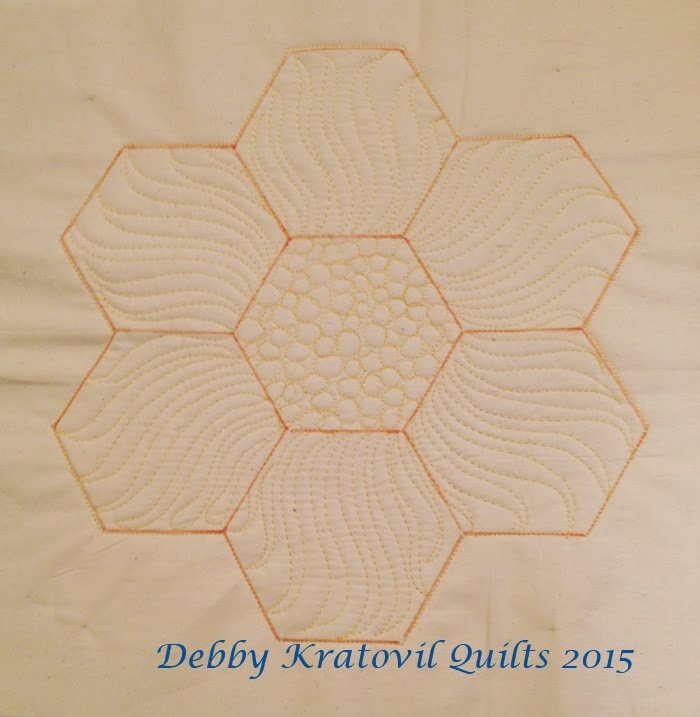 Here is Vicki's quilt (with her permission, of course!) Isn't it fabulous? So scrappy with so much color and texture that any child will spend hours just exploring the different fabrics. 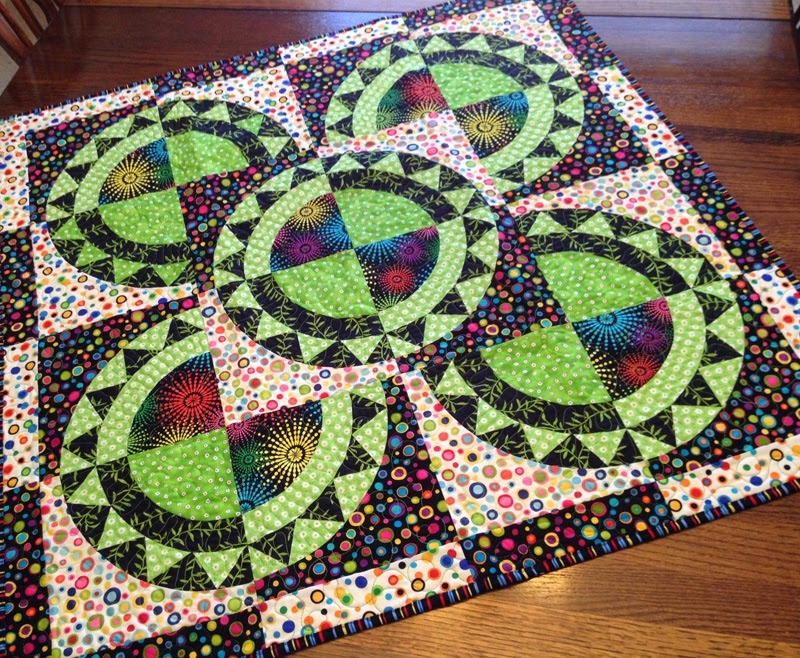 The blocks in this pattern are 14" square. 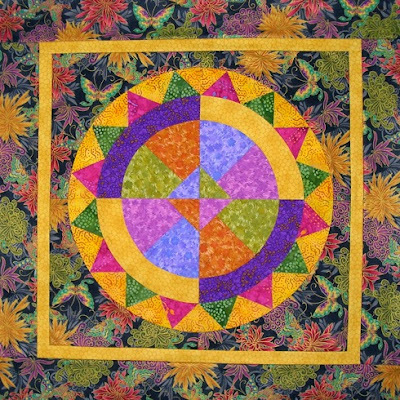 I did make a single block quilt several years ago. I used scraps and gave Sue a darker skin color. That's all the skin you can see because she hides her face under that big bonnet! I call it "Amish Sunbonnet Sue", but there's nothing Amish about her clothes. Have to eliminate those printed fabrics and only go with solids. See how much I know? I always enjoy seeing what people make with my patterns and from a workshop. Thank you, Vicki! I know the recipient of that quilt will treasure it for many years. 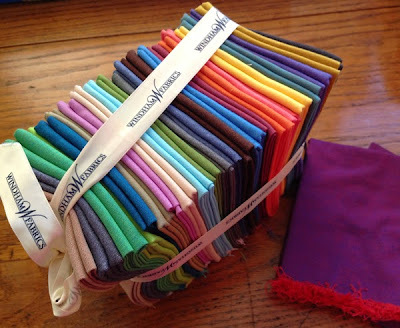 I love bright colors and Benartex's blog (Sew in Love With Fabric) sent me 6 colors from this fabulous collection. And they said, "Go sew! And share what you made in a tutorial." What fun! OK, Debby. What did you make? FOUR of these together . 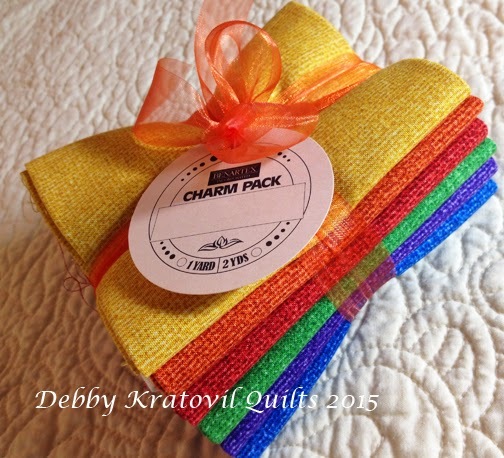 . .
A chance to win a fat quarter bundle of these six colors. EVERYONE WILL GET THIS PALM PATTERN FREE, of course. It's available at the Sew in Love with Fabric blog. OK? What do I need to do? For a second chance to win, follow Benartex on Facebook and leave a comment letting me know. The giveaway will remain open through midnight, Sunday May 17. 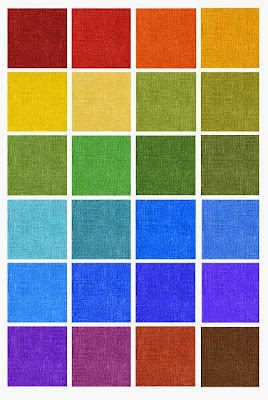 CONGRATULATIONS to Annie R. of Michigan, who won the fat quarter bundle of Burlap Brights from the Blog Hop last week. I hope you've been able to visit each of the bloggers and enter to win for each post. I love bright colors! They just speak to that happy part of me. 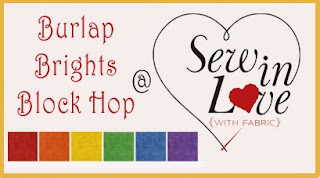 Sew in Love With Fabric (Benartex Fabrics blog) is having a blog hop that begins today (Monday, May 11). My day is Thursday, May 14. What do the brights look like? Here is the schedule. Make sure you come back on Thursday to see what I've done. And there will be a tutorial with a lot of pictures on how to make my block. That's all I'm saying! Go and be inspired by these other bloggers. 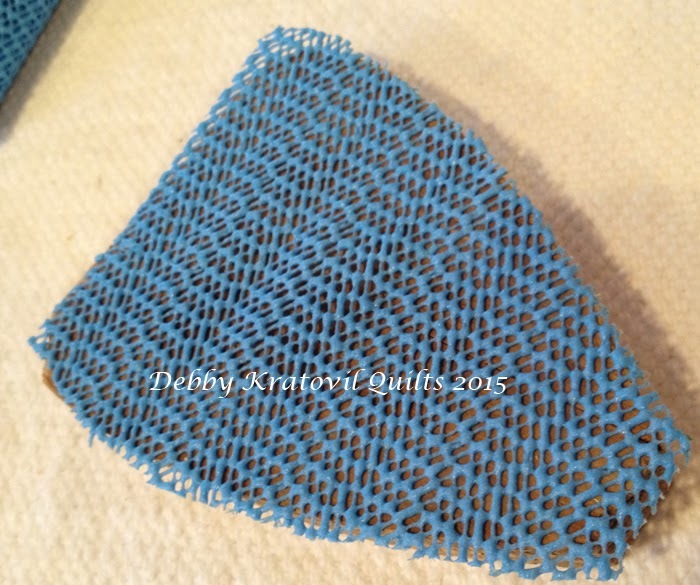 They post at 9:30 am (EST) on the Sew in Love with Fabric blog. I think I got a message from God this morning about my color choices. I looked out my kitchen window at my jungle of a yard (if we owned this house we would nuke the backyard and start over). 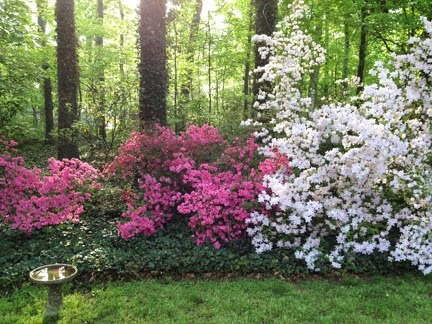 My azaleas are blooming and they are all in pinks and whites. Against the lush green backdrop I feel like I got an IM (instant message): "I love these colors. Go use them." I replied: I do use them and want to use them even more! Thanks for the confirmation. 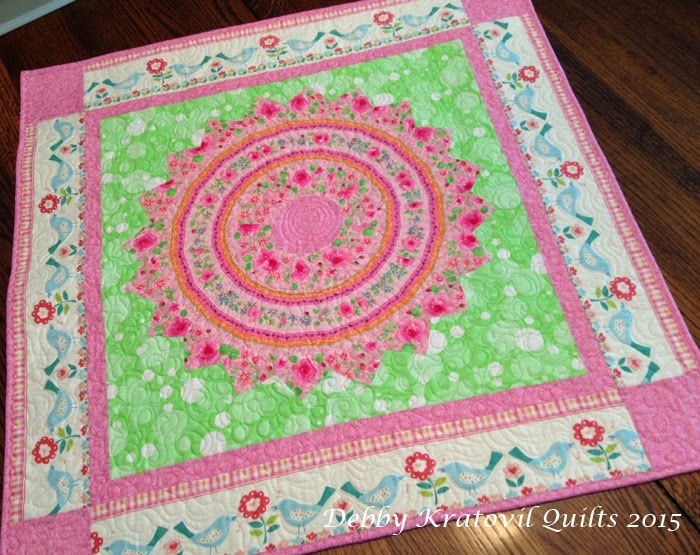 I made a super sized Dresden Plate quilt a few months ago using a very old border print. A border print with a Dresden Plate ruler? Why, sure! When you use a Dresden ruler (any angle) with a border print you have to cut for two blocks to get one. That's because you are flip-flopping the ruler back and forth on the fabric. I squeezed the life out of this half yard of fabric. 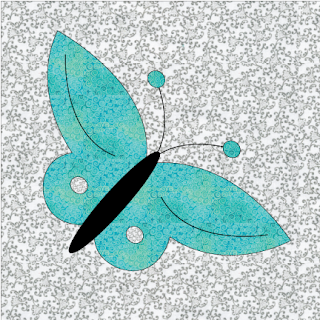 I loved putting it on that Spring Green dotted background fabric (Windham's .Com Collection). 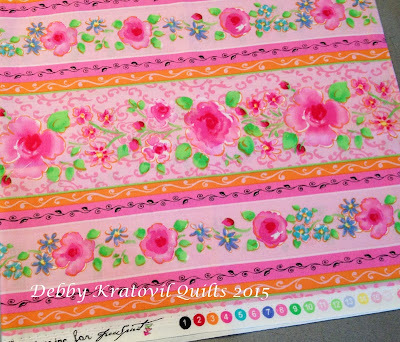 And the sweet bird border print was all I had left from 2-3 years ago sewing with a Benartex Collection (House and Home). More with Dresdens coming up soon. 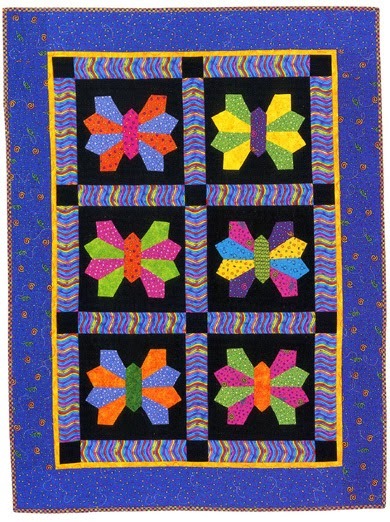 I have SO MANY quilts in a variety of styles and patterns that I'm thinking of having a Dresdens Page on this blog. Thanks for stopping by and seeing the azaleas-inspired quilt! 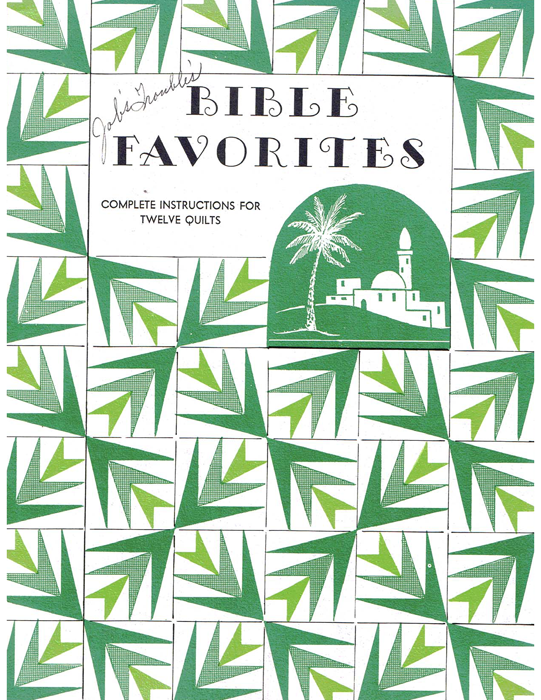 I have been sewing the Hosannah Palm Blocks for years. I even have one that has a seam down one center diagonal. 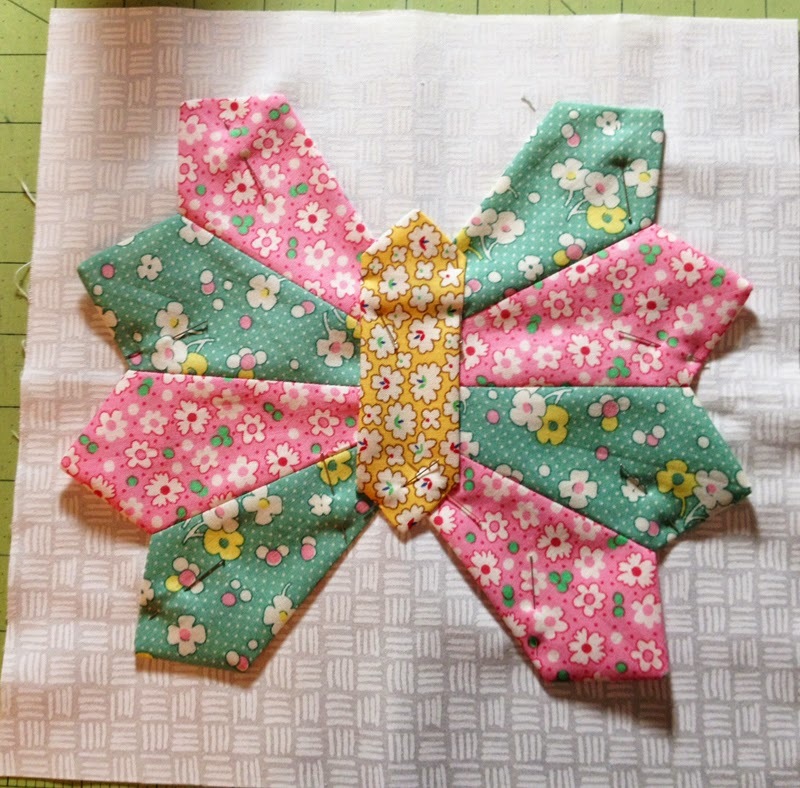 Traditionally this block has been sewn using templates. 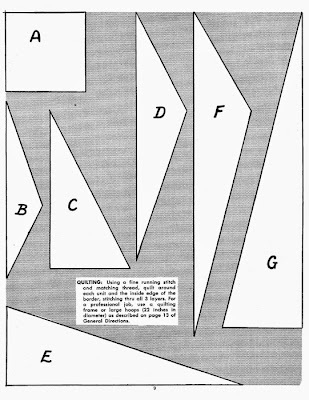 What do those templates look like (from a vintage quilt pattern book)? And now for the templates. Yikes! How do you like these templates? 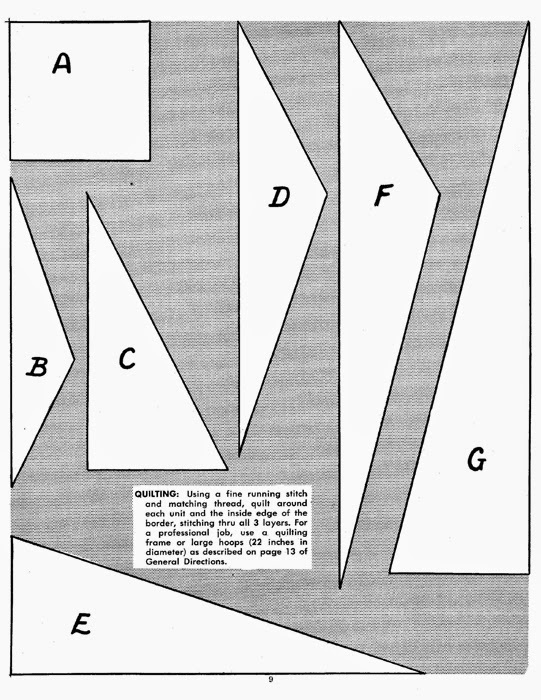 About 15 years ago I took this pattern and drafted it for a single foundation pieced unit. 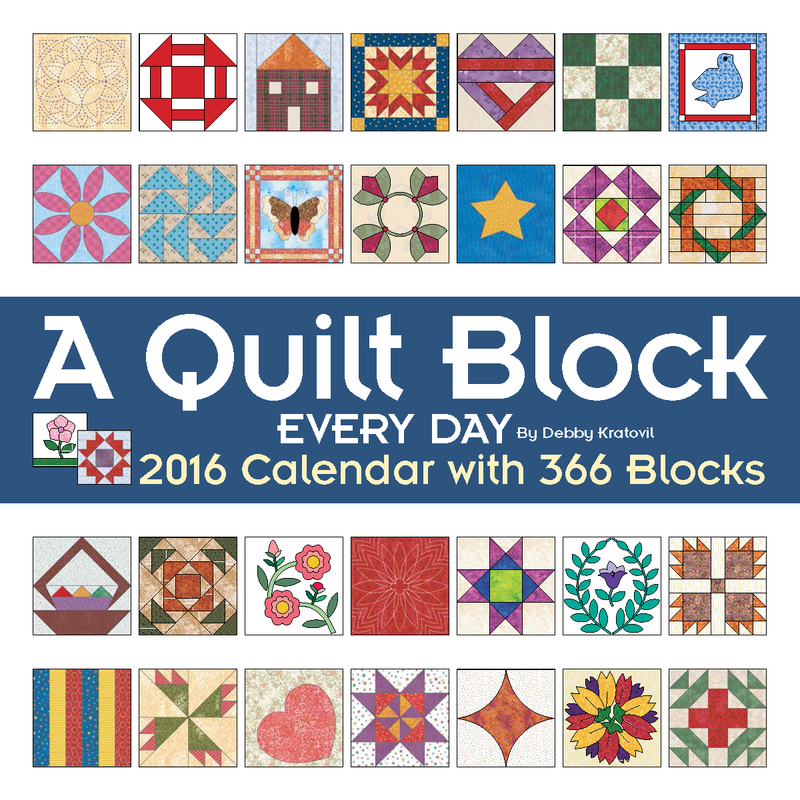 I have made quite a few blocks and quilts. 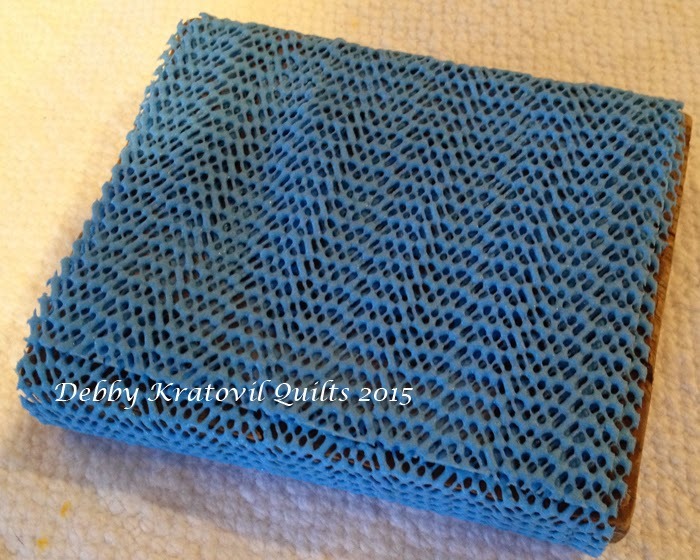 You can see some of them on my Palm Quilts Showing Off page. I put this up for the Vermont Quilt Guild that I am visiting TODAY and teaching the Hosannah Quilt to in a workshop. 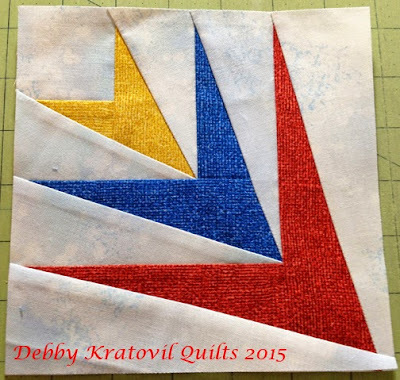 But to get myself up to speed, I pulled out some of my 10" foundations and some new shot cottons by Pepper Cory, I pieced 3 blocks in a new rendition using 3 colors for each palm frond. Want to see? Of course you do! I made these on Sunday afternoon. I am hoping to remake these using a bundle of Windham shot cottons called Artisan Cottons. Here is the bundle they sent in January. I've been waiting for some inspiration. What do you think? I don't want to use a gray as I did in the blocks above. In "real life" the gray dulls the shimmer of the fabrics. I think I'll use some sort of white. This will be a pattern on my Craftsy site. Because of the size, you will have to draft the block yourself. But that's where my directions come in. 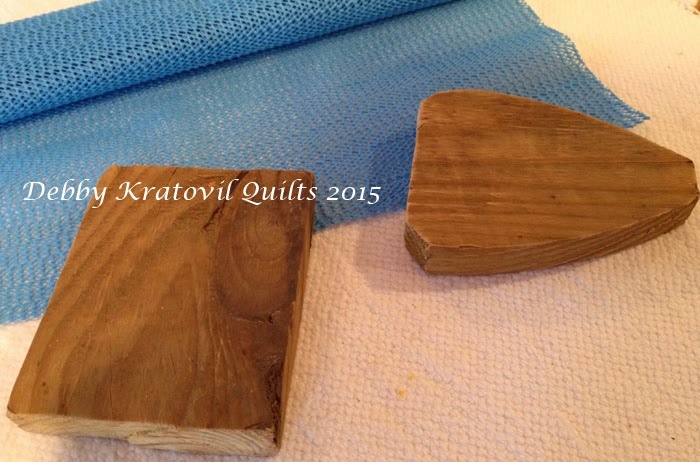 When I teach the workshop, I include a lesson on how to draft a Palm Block for any size. And when you're done piecing you have a block. This is created like an off-center log cabin. 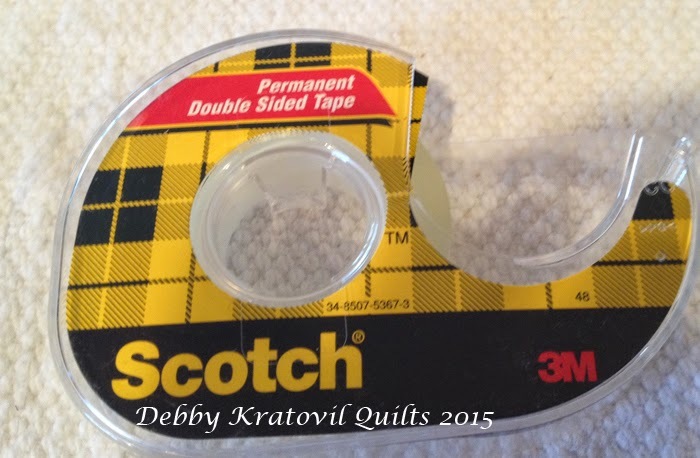 And as is true with many of my paper piecing patterns (at least the ones for my published books) I will include what size fabric to cut for which patches. Then the guesswork is gone. I'll keep you posted. Oh - and as is true in my last two books which include foundation piecing, I will have a lesson on how to make needle punched copies in case you don't want to go to the copy shop. One master can make many more patterns! I'll show some of my needle punched stacks soon. For now, I'm heading to Vermont and the husband has the dog to take care of (and the garden, mail, dinner, dishes, trash, etc - you get the picture). 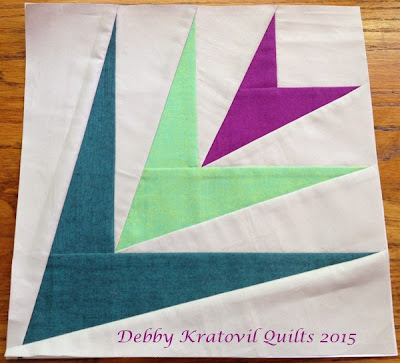 I am a HandiQuilter Ambassador and now use an HQ Sweet 16 sit down model to machine quilt my quilts. I have SO MANY quilt tops as the result of making samples for my classes. Let me show you my ingenious take on expensive MQ grippers. 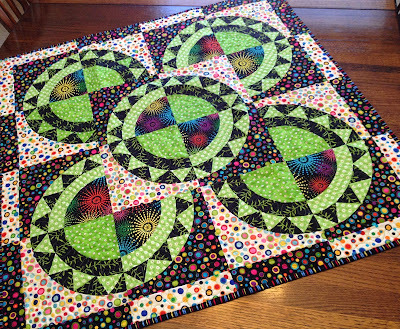 When a quilt is larger than a small table topper, it becomes quite a chore to push it around under any machine's needle. I have used gloves. I have used the tips of rubber gloves (these are my favorite). I regularly spit on my bare finger tips. But I needed something with a little weight, the right size and some serious gripping power. I asked my husband for some scrap wood about the size of my hands. He cut off the ends of an old wooden fence post he had in the garage. They're a different shape, but who cares? That's what we came up with. Notice that blue stuff. I bought it as the Dollar Store for - wait for it - a dollar! It is the rubber gripper stuff you put under your carpets to keep them from slipping on your wood or tile floor. I needed some tape . . . 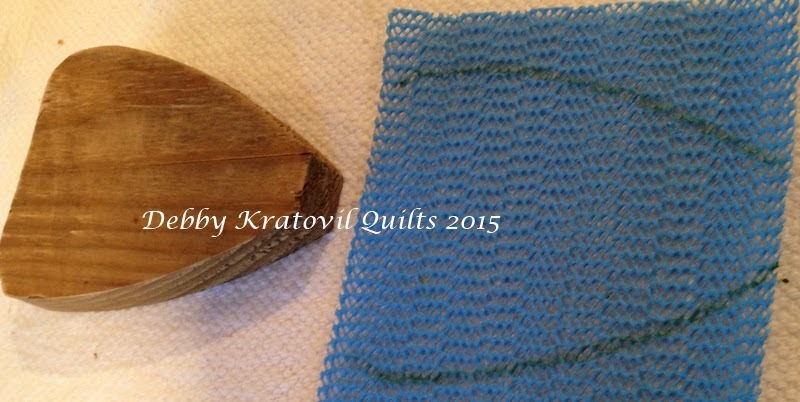 I cut a piece of the blue rubber to wrap around the square piece of wood and used the double sided tape to secure it. Then I traced the shape of the odd sized piece of wood onto the blue rubber and cut two out. Now, do they work? They sure do! 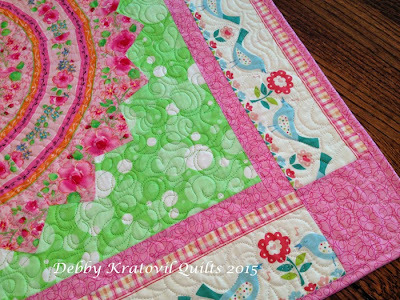 I will be sharing a few of my recent quilt finishes in the next week, including this Stacked Hearts quilt. I got brave and used stencils to mark a design and then quilted it. Very much like what I did a few months ago with this hexagon mat. 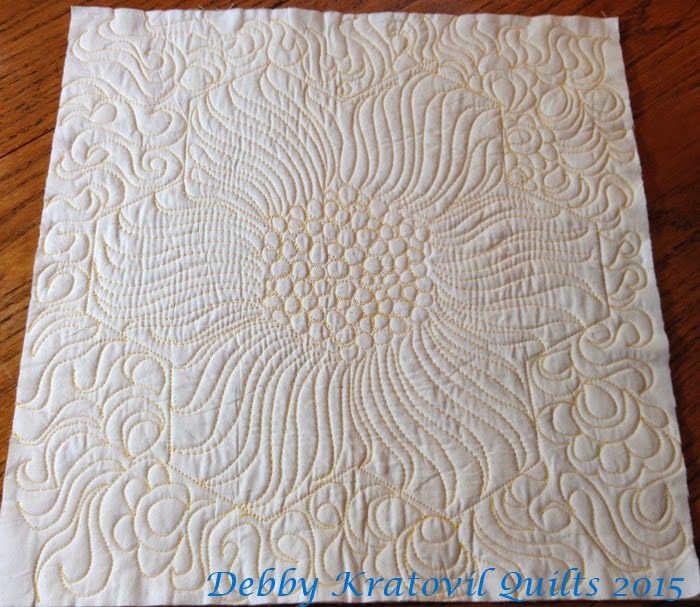 This is a class sample for when I teach Free Motion Quilting. Those marks are made with Washable Crayola Markers. They gave me the boundaries I needed to create my free motion designs. I'm trying to work myself up to stitching this New York Beauty quilt that has been in the works for about 6 years. I'm determined to find just the right stencil for the center. 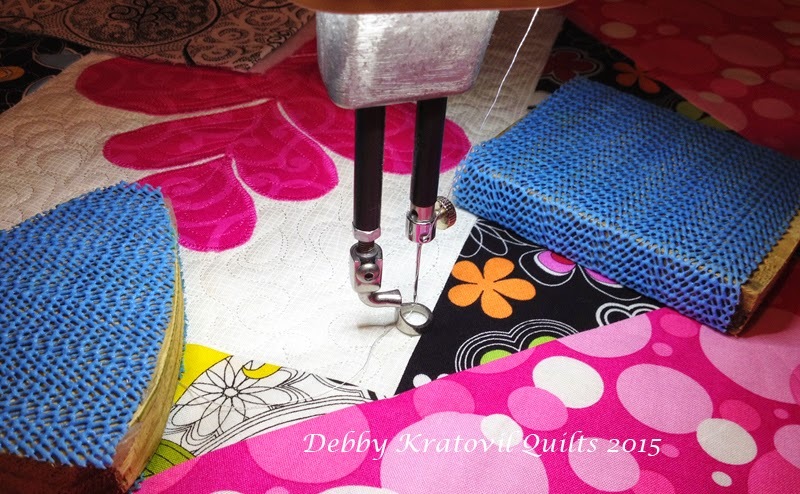 Stay tuned for more on my venture into quilting on this amazing machine with 16" of open space for my work. I have received several comments about blocks that are not coming out true to size. Sometimes it's in the 1/4" seam allowance. That I can't fix! 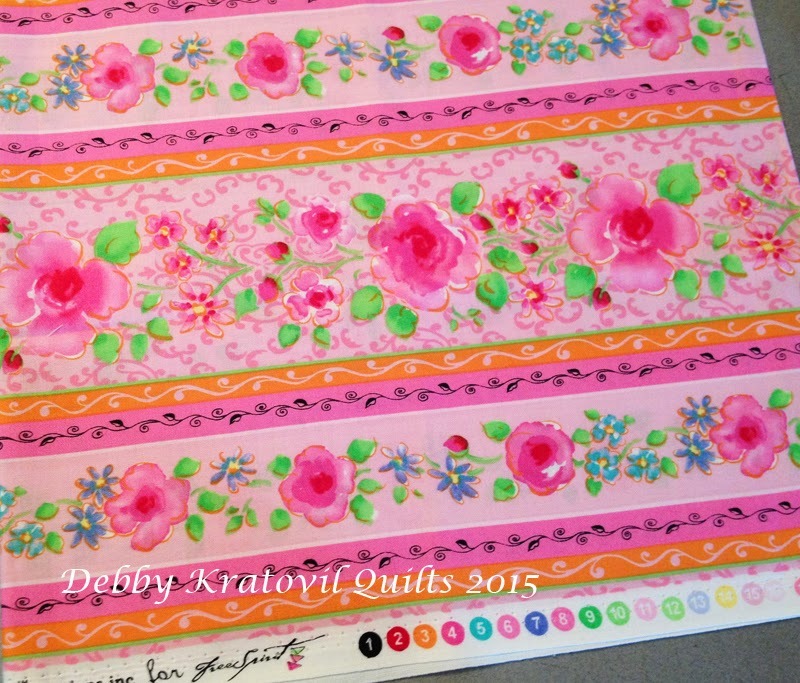 One comment came in that I can address and it has to do with making sure your printed pattern is coming out TRUE TO SIZE. I design and sew for publication and have for 23 years. I use Adobe Illustrator and not Electric Quilt or other non-vector based applications. While I readily admit having made errors in the past, my editors have caught most of them before publication. 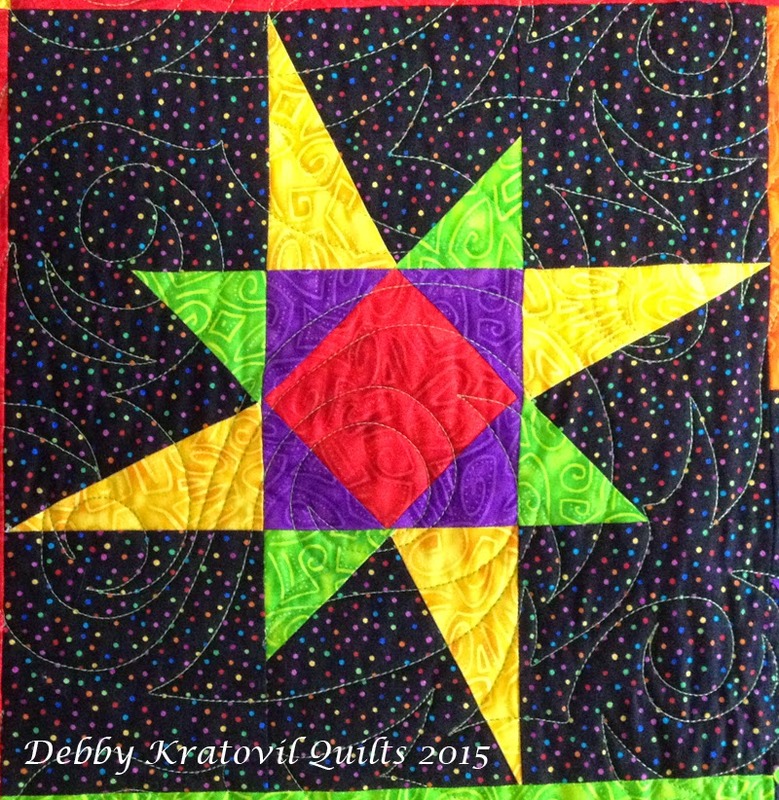 These Galaxy of Stars patterns have been published before and I want to assure my visitors that they can get perfect results by following just a few suggestions. If you don't, then look for "printer preferences" somewhere on your computer. Many printers "naturally" or by default shrink the end result by as much as 3-5%. That is a NO NO for quilters!! Right? Adjust your printer settings. OK. So how do you test my files? Here is a test file to print to check your printer settings today. I will try and rewrite my future BOM stars and include a 1" test square. 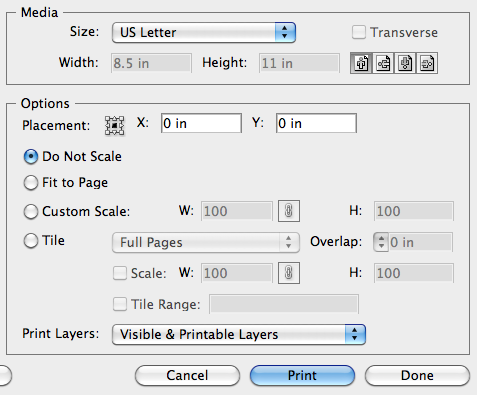 But for now, here is a TEST PAGE so you can print and check your settings. The file you will download includes the paper piecing units for the April and May blocks. It has a 1" square on the page that you can measure when printed. I have printed this and it is accurate using my printer. I hope this helps. I thank those who have written to me about this. Unfortunately, several are "no-reply comment" bloggers and I have no way to personally contact them. Thanks for your patience and happy sewing! Yes, can you believe it? Already May! How are you doing with your Galaxy of Stars blocks so far? Do not panic! I was once in a Block of the Month where I waited until December to sew all 12 blocks - and they were applique! I just wanted to wait until I saw all of them before I committed to my fabrics. 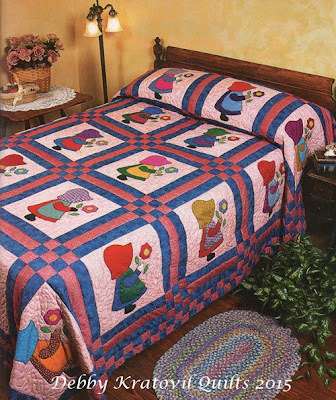 It was a lovely quilt and it won a ribbon at the county fair the following year. So, take it from me. There is no hurry. No one's keeping track! 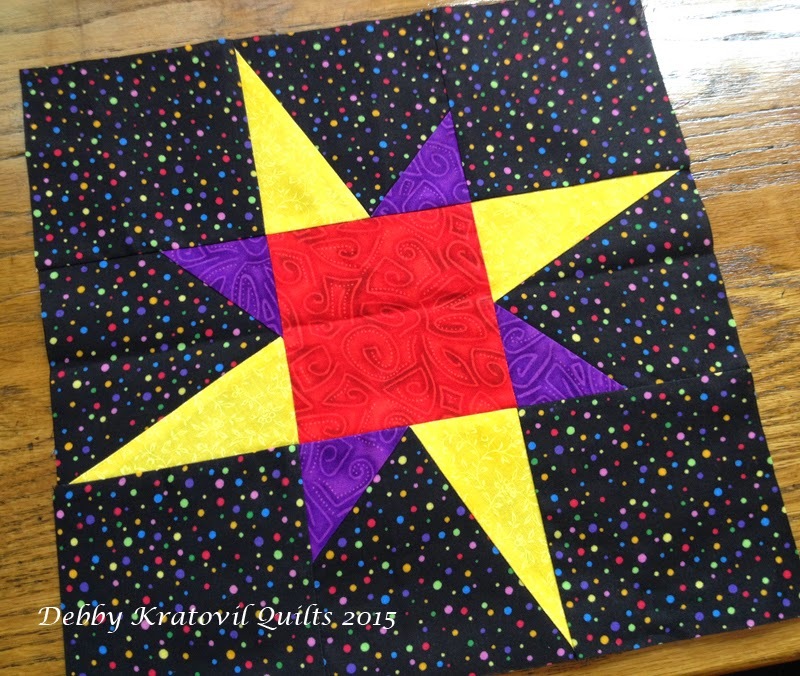 And how about just two colors for the star? And notice that the points are reversed. You can have the long point on the right or on the left; your choice! Now, it's time for the pattern. I hope you enjoy this. Let me know how you're doing and how you're keeping up, if you want.